Redland Chapel & Gallery, with the Marble Bust of John Cossins Esqr. who died 19 April 1759 & Martha his wife who died 11 Feb 1762.
bl.uk > Online Gallery Home	> Online exhibitions	> King George III Topographical Collection	> Redland Chapel & Gallery, with the Marble Bust of John Cossins Esqr. who died 19 April 1759 & Martha his wife who died 11 Feb 1762. 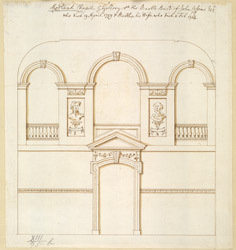 A elevation of the interior of the west end of Redland Chapel. It shows a doorway and gallery with three arches, balustrades, and busts of the chapel patron and his wife. Redlands Chapel was built at the expense of and endowed by John Cossins Esq. He was a London gentlemen who came from a wealthy grocer's family. He married Martha, the daughter of a Bristol merchant and settled here. He bought the Redlands estate in the 1730s and replaced the old 17th century manor house with a fashionable mansion lavishly decorated with classical motifs. This chapel interior is also in the classical style with numerous classical decorations and motifs.